The JFKS Music Department offers a Suzuki violin program for children starting in the Entrance Class and continuing through 4th grade, in 5th grade the students can join the Advanced Strings group within the 5th grade Music Program and eventually the 6th Grade Advanced Orchestra. Each school year fifteen Entrance Class students start playing the violin according to the “Suzuki Method” and continue instruction during the following school years either just within the group or in combination with individual instruction. The group instruction with parents takes place three times a week from 8:00 to 8:45h. The children start with cardboard violins, made by their parents, until they have learned posture and bowing rythms. They progress to real instruments (provided by the parents) together at the same time once they have reached the appropriate level. In the spring, the Entrance Class violin students first perform at the Entrance Class singing circle, and at the Summer Concert they are playing together with the older students for the first time. During one group lesson per week, taking place in the afternoon after school, the students repeat and extend the repertoire from entrance class. The repertoire played with fingers includes music from the Twinkle variations to “Perpetual Motions”. It is recommended to complement the group instruction with individual private lessons for better progress. During one group lesson per week, taking place in the afternoon after school, the students repeat and extend the repertoire from the previous years. Depending on the individual level, the grade level can vary. The goal is to learn all the so called “Volume 1 pieces”. During this group lesson, taking place during the 5th grade regular instruction time as part of the 5th Grade Music Program, students on an advanced level can work together on ensemble pieces. All 5th grade advanced string players can join this group, participation in the Suzuki group program during previous years is not required. The “Mother Tongue Method” invented by Japanese Dr. Shinichi Suzuki at the end of the 1940s, teaches children to learn by listening – contrary to the traditional methods. The supporting parents are an integral part of the Teacher-Child-Parent-Group and help their children to learn and memorize a instrumental-didactically progressing, set repertoire. 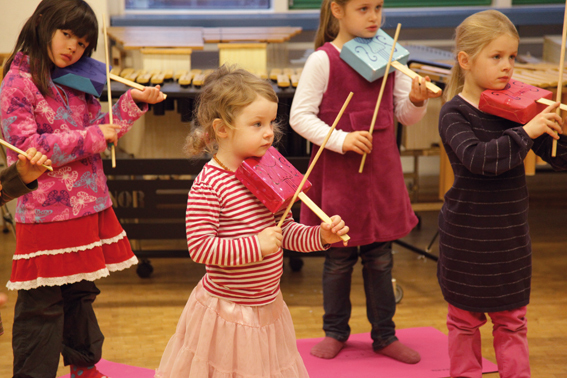 This way students of all age groups and levels can play and perform together as an ensemble. In general the students play folk songs, Irish fiddle pieces and Baroque music. The advanced violin students play solo pieces or ensemble music extending and enriching the basic Suzuki repertoire. After a beginning phase the children will also be introduced intellectually to written music. Depending on the involvement and capacity of the student, sight reading and playing from written music should be learned as soon as possible to become independent from playing by imitation. 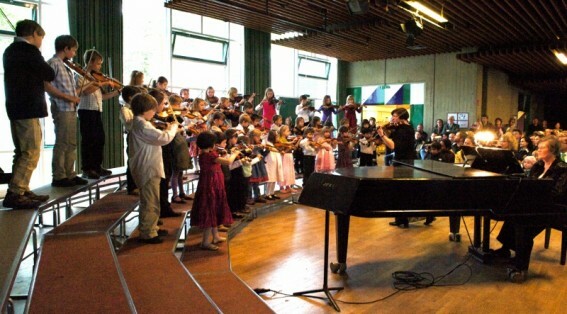 In the course of the past ten years, the number of violin playing children has continually increased and regular concerts complement the instruction. Esther Freymadl has worked as a violin instructor since 1996 and as a German and Music high school teacher at JFKS since 2002. She received her certificate as a “European A-level Instructor” for the Suzuki Method in 2005 after five years of training at the German Suzuki Institute lead by Kerstin Wartberg. The violin program is supported by Elizabeth Poland who was a music teacher and orchestra director at JFKS for decades, and who accompanies the students on the piano or the organ. The classes are held in German. Click here for the latest schedule of classes offered.